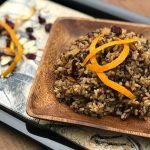 Several kinds of rice come together with cranberries and almonds in a make-ahead salad that can be served warm or cold. Great for a crowd. In a small jar with a screw-top lid, put the olive oil, vinegar, zest, juice, and honey. In a large bowl, combine the rice, cranberries, and almonds. Add dressing and season with pepper. I add a little salt when I cook the rice, so I don't find I need to add any to the salad.